No. 7 already uses bags in their shop, plan brown paper bags, extremely modest, but also rather bare. I want to add No. 7's logo to their bag, something simple. Centralised logo on the bag, with their brand name underneath, very simple in a dark brown colour. Possibly screen printed. If I were to do something similar, I would have to screen print onto the bag, as digital printing isn't an option, for a thin GSM in LCA. A two colour design, this was probably screen printed, however with only two colours It would be relatively easy to reproduce. However, I have a feeling this bag was digitally printed, which, sadly isn't an option for me. 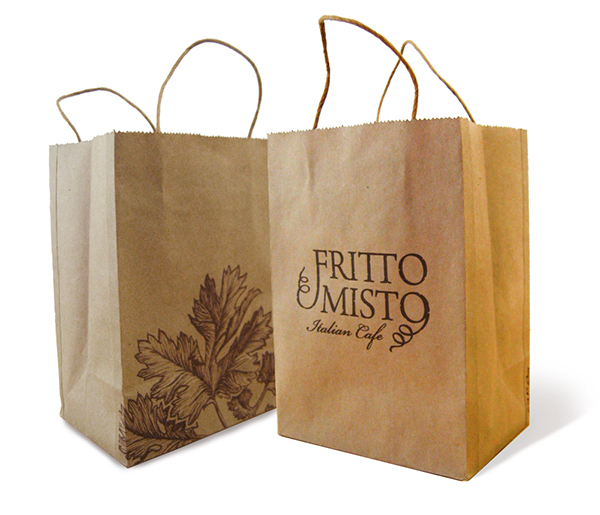 This example uses white, printed onto the bag. It's fairly interesting, the white contrasts with the brown of the bag rather well. It stands out, and is very readable.